NOTE: This is the second Friday of the month. 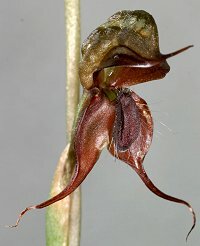 Our guest speaker this month at our new venue will be Bill Kosky who will be presenting "Pterostylis Rufa Complex - Bentham's Mistake". 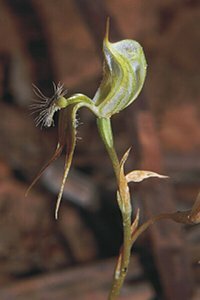 Bill has been studying Rufa Pterostylis in the field for many years now and has come up with some interesting observations. Once a month ANOS Vic. members get together to discuss orchid cultivation and conservation, admire our beautiful Australasian orchids, listen to knowledgeable speakers, to purchase orchids or just to socialise. Eleven meetings are held each year, from February through to December. The formal part of the meeting commences at 8pm, but proceedings start to get underway from about 7pm allowing members and visitors plenty of time to view the orchids and purchase plants from the sales bench. The community centre is located in the central reserve opposite the Bowls Club at the south west corner of the intersection of Waverley and Springvale Roads. There is ample off street parking within the reserve. Meetings are now being held at our new venue, Glen Waverley Community Centre, 700 Waverley Road, GLEN WAVERLEY. NOTE: This is not to be confused with our Spring Show venue at the Mount Waverley Community Centre. NOTE: This meeting is being held on the second Friday in May. 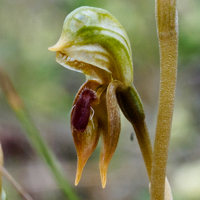 Our guest speaker will be Bill Kosky who will be presenting "Pterostylis rufa complex in Victoria - Bentham's Mistake". Our guest speaker will be Mike Pielor who will be presenting three short talks. Our guest speaker will be Jenna Wraith who will be presenting "A Continental Scale Analysis of Threats to Orchids". Our guest speaker will be Richard Thomson who will be discussing terrestrial orchids (To be confirmed). Our guest speaker will be Wayne Harris who will be discussing Dendrobiums (To be confirmed). Our guest speaker will be Lalita Simpsony who will be presenting "Evolution of the orchids through time and space - how biogeography has shaped orchid diversity". 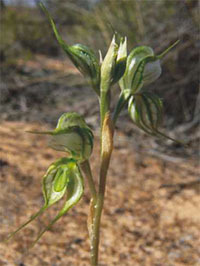 Our guest speaker will be Andrew Brown who will be presenting "Western Australia's Superb Sun Orchids". Guest speaker and presentation topic to be advised. Each month members are requested to submit their questions regarding the cultivation of epiphytic or terrestrial orchids. Your questions will then be put to expert growers at the meeting for answers which will subsequently be published in the Bulletin. Members can bring in their orchids and display them on the benches at the meetings so that others may enjoy them. We are not a judging society so orchids are not compared and rated against each other. However we do award certificates for good culture. To receive a certificate an orchid must be owned by the grower for a minimum of 3 years and should be grown well for that particular species or hybrid. If you are having problems with growing a particular orchid, bring it along to the help table and our members will be happy to give their advice on how to best care for it. If your orchid has an insect infestation, rust or viral disease please cover it to prevent it from contaminating other orchids benched at the meeting. At each meeting there are always orchids for sale. Both mature orchids and seedlings are available from members and sometimes from commercial sellers. We also sell publications on the care of orchids as well as other merchandise. For a complete list please refer to our merchandise page . Visitors are always welcome to our meetings. Come along and meet our members and see for yourself what an active organisation we are before deciding to join.